WeFi is software loaded onto your laptop or mobile device. WeFi automatically detects and qualifies all Wi-Fi access points within range and connects you to the spot with the best Internet connection. If the WeFi software detects a new access point, WeFi allows you to be the first to map it. WeFi also provides you with Instant-Messaging tools, allowing you to create a buddy list, and to see where your friends are currently connected. ...... helps keep you connected to the fastest most reliable network around. Wefi users can move between open Wi-Fi networks automatically, without having to manually choose or click around between new networks. WeFi's platform provides instant relief to congested data networks utilizing untapped Wi-Fi resources. Our unique solution is based on client-side software on subscribers' devices, and a server environment including a powerful backend management and control system. 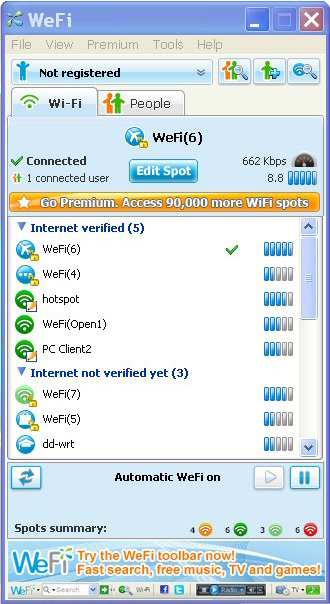 WeFi is support Windows XP, Vista and Windows 7 and Mac, Mobiel etc. download WeFi for reliable connection to Wi-Fi anywhere a wireless network is available, see online status and location of friends and find an available hotspot anywhere around the world! Qweas is providing links to WeFi 4.0.1.0 as a courtesy, and makes no representations regarding WeFi or any other applications or any information related thereto. Any questions, complaints or claims regarding this application WeFi 4.0.1.0 must be directed to the appropriate software vendor. You may click the publisher link of WeFi on the top of this page to get more details about the vendor.